You are here: Home / Newsletters / Newsletters | Philippines / Pastor Roy Rocha / PHILIPPINES – ADVENT CHRISTIAN MOVEMENT (ACM) MANILA. Pastor Roy Rocha and family. 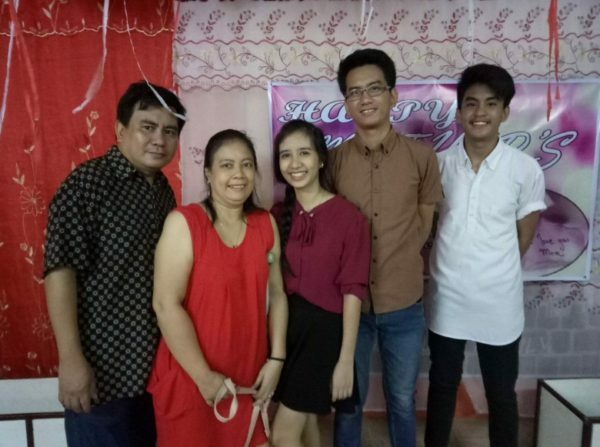 PHILIPPINES – ADVENT CHRISTIAN MOVEMENT (ACM) MANILA. Pastor Roy Rocha and family. Pastor Roy Rocha and his family had a difficult year last year – 2017. Pastor Roy, who pastors a thriving church in Manila, has been very unwell for many months and is slowly recovering from “burn out” suffered early last year. He is presently waiting to have an MRI on his spine and brain to try and identify why he is in constant, severe pain. He can no longer lift anything – even something small like a chair. The MRI is, of course, very expensive. His younger son had an accident playing basketball and suffered a serious fracture to his arm which required complex surgery and the insertion of plates. Roy and his wife Llerma and their children have been and are suffering financially, physically and emotionally – please pray regularly that the Lord will heal and provide for them. Pray too for the church congregation and their ministries. This verse inspires me as I face 2018. As you know, 2017 was not a good year for me. I was not struggling in the ministry but was physically. Then my youngest son got into accident in which distracted me more emotionally and financially. And because of those events in my life, I seem lost focus in the ministry as I used to do. I was about to quit to the point that I was thinking of dying. It was not really a good year for me. But, God is good that I am still well today. Thanks to all your prayers and support for I believe I am recovering. I am so blessed to have friends, brothers and ministry partner like you at ACNZ, I feel better than last year. As this New Year 2018, I say “I am back” and more focus on the things that I am supposed to do. This February, we at New Life host a seminar on “TRUE LOVE WAITS” among young people from age 13. There will be two seminars, one will be in our church this Feb. 18 and the second will be in the Barangay Hall on early March. The barangay is for the unbelievers and out of school youth. They (barangay) requested us to help them in their program in the areas of youth development. The barangay chairman is saddened by the reports that as young as 13 years old are already pregnant and are no longer interested in their studies that resulted to creating more problem in our barangay. So pray that we can be an instrument of enlightenment to the young people and most especially they will accept Jesus as Lord and Savior. I also want to share on my plans to be part of teaching staff in a Bible College here in Manila. I had been invited 2 years ago and it seems I am leaning to accept the invitation this year. So this other ministry opportunity. I started a series of Discipleship training in my home church at Tagolaon [on Mindanao] last time I was there but because of the accident of my son the training was cut. This time I like to go back and continue. I will also be visiting Malitbog and Damilag in which I pastored for years while I was student in Oro Bible College. So pray that my time with them will be both encouraging to us. These are my activities this year! Again, I am so thankful for all your prayers!